Employees today spend as much time or even more at work than they do at home. Offices become almost a second home, if not the first, for many workers. The impact of office design on employees engagement, moods, attitudes, and health has become a focus of discussion between the HR and Admin department, engaging architects, interior designers and engineers outside the organization. As organizations become more competitive in keeping their talents and people, office design becomes one of the “perks” that keep employees looking forward to going to work on a daily basis. So how can integrating Terrazzo in your office design contribute to employee engagement and HR efforts to improve work environment? The total space provided for employees set the tone for their mood. Not considering all other factors that are in play such as office culture, structure, issues and resolutions, office design can influence mood. Design doesn’t stop in the pantry or the production area. Design can stretch to the toilets or even the hidden server rooms. For example, exchanging the standard toilet dividers with Terrazzo Toilet Partitions can add a sense of comfort and privacy. Or adding green and light blue accents in the lobby Terrazzo Flooring can present a calm and peaceful environment. Replacing carpets with Terrazzo flooring also improves cleanliness in the office space. Cleaning spaces become easier with Terrazzo flooring. This makes it easier for the Maintenance team to implement easier cleaning measures on a regular basis, unlike having to vacuum the carpet consistently, and wash the carpet with all the other furniture and office fixture on top of it. Having Terrazzo flooring significantly reinforces cleanliness in the office space. High traffic arreas can produce noise levels that can disrupt work of employees. Accoustics in the office can amplify or reduce noise, depending on the materials used. Choosing terrazzo for walls and partitions instead of plyboard or plywood can make office sections quieter and less prone to outside noise. It is important for workers to work in environments where they can get the right amount of “white noise” as needed. Quieter environments are of course more ideal, but depending on the nature of the business, accoustics and sounds can also add to the feel of the space. Most businesses require quiet spaces for optimal productivity for office workers. 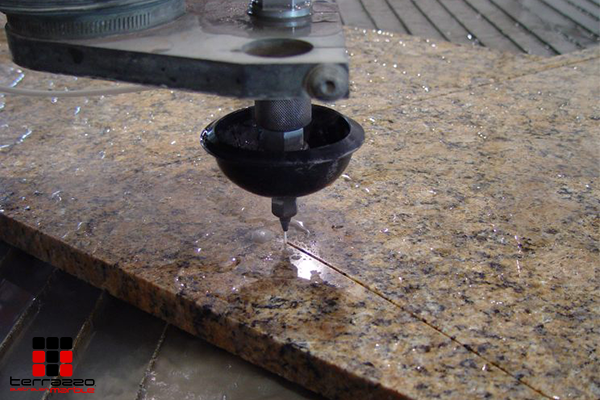 To know more about Terrazzo and how to integrate this material in your office design, talk to top terrazzo suppliers such as Terrazzo Australian Marble. Improving office design becomes easier with expert recommendations. 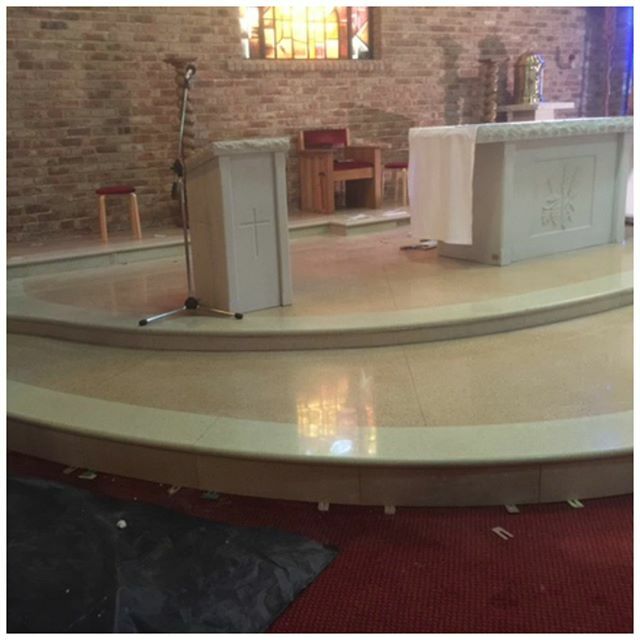 In every large or small terrazzo installation, the distinct design as seen through the eyes of those who will appreciate and experience the structure is of utmost importance. The intricate details carried through the imaginative designs make Terrazzo Marble stand out further while complementing the existing installations around it. First of all let’s make it clear right from the start, modern terrazzo design is practically limitless! And, when we say limitless, it IS UNLIMITED! Unlike the olden times, Terrazzo has transformed with the minds of its users and is no longer used just for floor tiles. In fact terrazzo-inspired designs have once again come to the fore of modern design! With the boom of modern influence in every nook and cranny, the humble terrazzo has been utilized to more than its expected potential by creative individuals, and with beautifully unexpected results. Let us explore the basics of terrazzo tile and see what we’re missing! A- Artistic. B- Beautiful. C- Colourful. D- Durable. The possibilities are limitless! That is the first thing you need to know about this brilliant construction material. For hundreds of years Terrazzo has aptly demonstrated why it has become the tile flooring material of choice in the most enduring and most beautiful structures around the world. Since it was first discovered and used by Venetian workers in Europe centuries ago, Terrazzo use has spread all over the world because of its innate beauty and permanence. Artistic. Terrazzo as a construction material has proven that creative use of it has no boundaries! This dazzling material is now highly used as a striking canvass to show intricate company logos in business offices and works of art by avant garde artists, and as room or building centerpieces by most renowned interior designers and architects around the world! 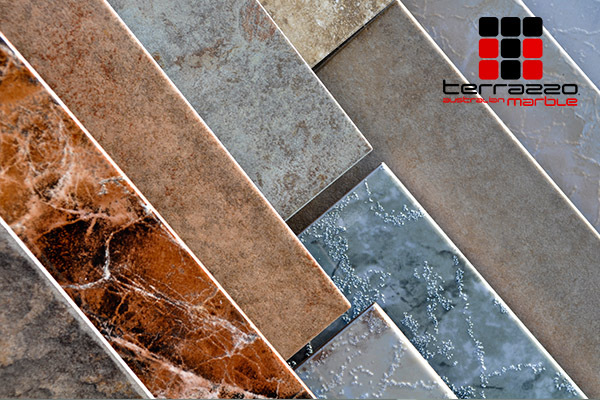 Only one’s creative imagination and exploring mind is the limit to what one wants to create with terrazzo. Your Business Logo Etched in In situ Terrazzo: Strong as can be! Thinking of incorporating your business or company logo onto your office premises? No problem with In situ Terrazzo! With a wide range of amazing colours you can be rest assured that even a special trademark colour mix of your own and even the exact design of your logo can be achieved and replicated by our highly experienced craftsmen. 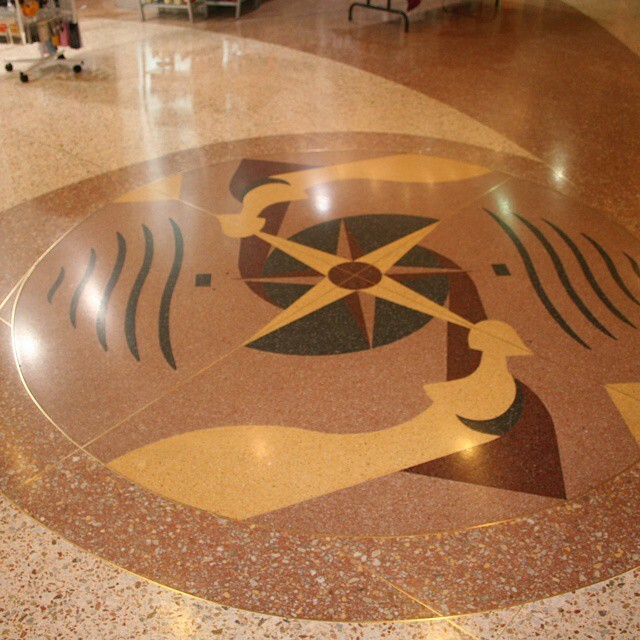 With the advanced waterjet technology, in situ terrazzo is perfect for incorporating logos, terrazzo art, shapes and colours. 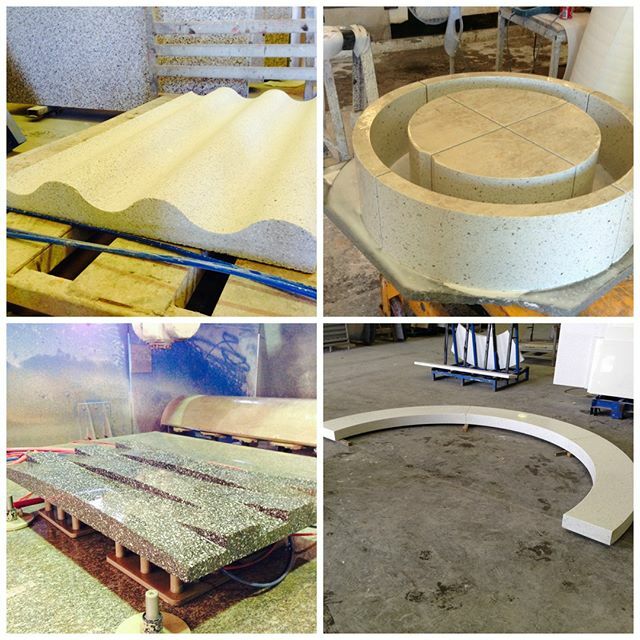 What more, and importantly it is impressing upon your clients that your business is strong as a rock since your logo is carved on long-lasting Terrazzo, one of the strongest man-made construction materials available in the planet! Terrazzo: Once regarded the flooring of royalty can now be yours! Terrazzo was once esteemed in the old times as flooring fit only for royalty in grand palaces and important religious structures and places. Today, hundreds of years later modern terrazzo has now grown leaps and bounds to become more accessible to everyone with the penchant for its beauty and permanence. More and more advanced countries are now ostentatiously familiar with the classic magnificence and elegance of terrazzo. Renowned Architects and flamboyant Interior Designers in Australia and all over the world recognize the unbounded flexibility and inspiration of terrazzo materials. Terrazzo is now well recognized around the globe not just for its design and artistry but for its durability and resilience as well. You can feel the impression of being comparable to royalty when you enter into your own home fitted with all terrazzo materials from the inside and outside starting with your magnificent terrazzo flooring to pre cast terrazzo which you can sensibly use in various and very beautiful applications which may include but not limited to stairs, steps and risers, skirting, wall panels, coving, benchtops for kitchens, bathrooms and lavatories, and all other work areas in general, columns, shower partitions and very recently in public furniture in parks and walkways. With today’s highly advanced processes, Pre cast terrazzo is offered in exacting standards in various sizes, attractive colors and eye-catching finishes.